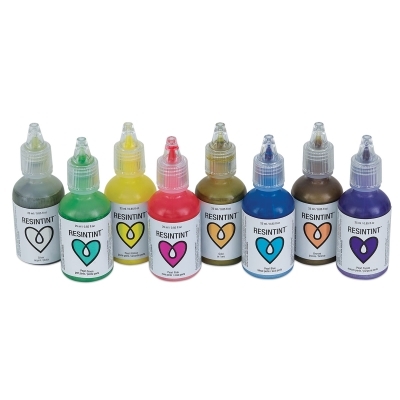 Simple and fun, ArtResin ResinTint is a premium liquid-pigment colorant. Crafted for compatibility with ArtResin Epoxy Resin, these tints offer rich saturation and wonderful hues. This set includes Metallic Silver, Metallic Bronze, Metallic Gold, Pearl Pink, Pearl Yellow, Pearl Green, Pearl Blue, and Pearl Purple in 0.85 oz (25 ml) bottles. ® ArtResin is a registered trademark.® ResinTint is a registered trademark.